Watch Müpa Live Webcasts in HD quality. Müpa Budapest streams occasionally live broadcasts of its classical and popular music concerts on its website. Enjoy Müpa Budapest shows in the comfort of your own home. 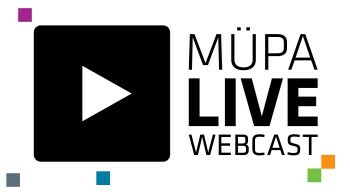 Receive notification about the next Müpa Live Webcast broadcast. Sign up for our notification email, and we will alert you 1 hour before the start of the concert. Signing up is subject to registration. If you have already registered on our website, please log in.